With This Nest...: "We Have Chosen Hope Over Fear"
"We Have Chosen Hope Over Fear"
It's been a rough day in my little world, but witnessing today's events still fills me with a sense of hope. 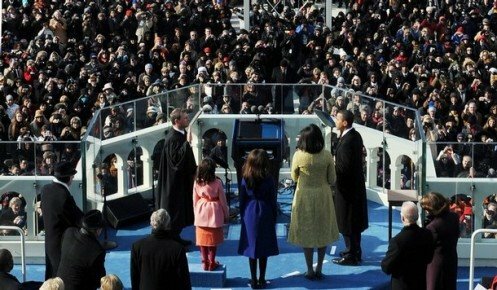 I stood out in the snow in Chicago and watched our 44th president being sworn in, something I am not likely to forget anytime soon. No matter what your political beliefs may be, I hope that feeling of optimism finds you as well. And at the very least you have to agree that Sasha Obama is simply too cute standing on her little box up there, watching her Dad become president. or how about Malia taking pictures with her digital camera during the ceremony? so precious. i'm so excited to have little kids in the whitehouse. they're such a beautiful family. it's awesome that you were there to witness history in the making. i watched cnn.com from the computer lab on campus. I couldn't agree more! I was definitely filled with my joy and hope. Those little girls are absolutely the cutest things ever!